Fine dining is a symphony of flavors, smells, sights, and even sounds; a work of art, a masterpiece of the chef de cuisine, combined with the luxurious and stunningly gorgeous flatware and crockery, and service fit for a king. Quite a few establishments claim to understand what fine dining is, yet very few are able to deliver on that unsaid promise. Fine dining isn’t just about serving food that looks like a piece of art, it’s about the ambiance, the atmosphere, the flavors, and the smells that all combine to give you the experience of a lifetime. That said, here is a list of five fine dining restaurants that deserve a mention for serving the most luxurious food and delivering the best experiences, in alphabetical order. Alinea is located in Lincoln Park, Chicago and hosts contemporary décor, and special mood lighting, but the best part is the food. Tasting menus have 15 to 19 tantalizing courses with artistic plating and theatrical elements under the supervision of their innovative head chef, Grant Achatz. Arzak, under the supervision of chef Juan Mari Arzak and his daughter, Elena Arzak Espina, is about traditional, local cuisine fused with cutting-edge techniques. Tradition is heavily emphasized in their beautiful food and presentation. Under the supervision of Heston Blumenthal’s trusted chef, Ashley Palmer-Watts, this restaurant boasts some of the best culinary experiences in Europe. With Heston’s signature, new age techniques to recreate the masterpieces of British culinary history. Located in the New York’s Credit Suisse building, the contemporary Eleven Madison Park is perhaps one of the finest food establishments in the continental US. The experience is breathtaking and stupefyingly entertaining, to say the least. 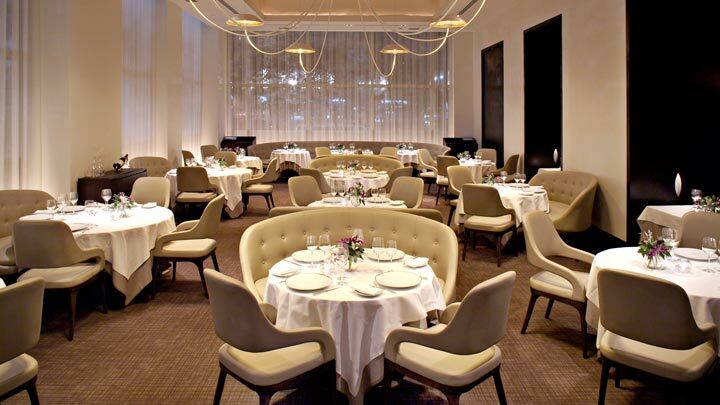 Ranging from their card trick, to leaving the diner to make their own dish on their table with the ingredients present, the spacious restaurant offers an exceptionally fun, fine dining experience under chef Daniel Humm. Chef René Redzepi treats you to some of the best food cooked with the best Nordic ingredients you can find at his restaurant Noma, in Copenhagen. The restaurant serves diners with a series of ten ‘snacks’ or appetizers, that is followed by 10 courses with fare such as beef tartar and ants, and is finished off with an even more stunning range of sweet treats. Even though some of the food served here can shock you, the flavors and taste definitely will shock you, and we mean that in the best of ways!